I know October hasn't come to a close just yet, and there's still plenty of candy to be gathered in an attempt to derail those fall training diets; however, we have to look forward to a full slate of exciting running events that start as soon as this weekend! I'm anxiously looking forward to several events this month, including the newest race to hit the streets of New Orleans, plus a few events that are new to me and I'll be running for the first time. Thankfully, the month of November is starting off with beautiful weather for one of my favorite half marathons of the year on Saturday, and I'm hoping it continues every weekend for the foreseeable future. Jazz Half Marathon & 5K (Saturday, November 1st @ 7:00 a.m.) - Now in its 6th year, this race benefits the cancer program at Children's Hospital New Orleans. A post-race party in Lafayette Square last well in to the afternoon and features great local music. Q50 Dia de los Muertos 5 & 10 Milers (Saturday, November 1st @ 6:45 p.m.) - Bring the headlamps for a nighttime trail run through Fontainebleau State Park. Team runs are possible, costumes are optional. Cajun Cup 10K & 1 Mile (Saturday, November 8th @ 8:05 a.m.) - This year, Lafayette's premiere 10K road-race is hosting the RRCA's National Championship 10K race. Also introduced this year are medals for all 10K and 10K Challenge participants. Crescent City Fall Classic 5K (Saturday, November 8th @ 8:30 a.m.) - The Fall Classic is your one 5K shot at qualifying for a coveted seeded time in the Allstate Sugar Bowl CCC10K in April 2015. Middendorf's Manchac Run 10 Miler, 10K, & 5K (Saturday, November 15th @ 8:00 a.m.) - The first event in the "Round The Lake" Series, it is the RRCA State 10-Mile Championship event and the Louisiana Senior Olympics 10K State Championship race. Q50 Full Moon Midnight 7 & 14 Milers (Saturday, November 15th @ 11:59 p.m.) - Requirements to participate in this looped trail run include camelback, water bottle, or hydration belt, headlamp and a whistle, no headphones! Woman's Half Marathon & 10K (Sunday, November 16th @ 7:00 a.m.) - Don't think this race is for women only. Men are more than welcome to run and support Woman's Hospital of Baton Rouge. Plus, real men will wear pink as they complete 13.1 miles. Heart & Soles Half Marathon & 5K (Saturday, November 22nd @ 7:00 a.m.) - Rock the red carpet for a stylish finish a this Terrebone Parish race benefiting the Cardiovascular Institute of the South. 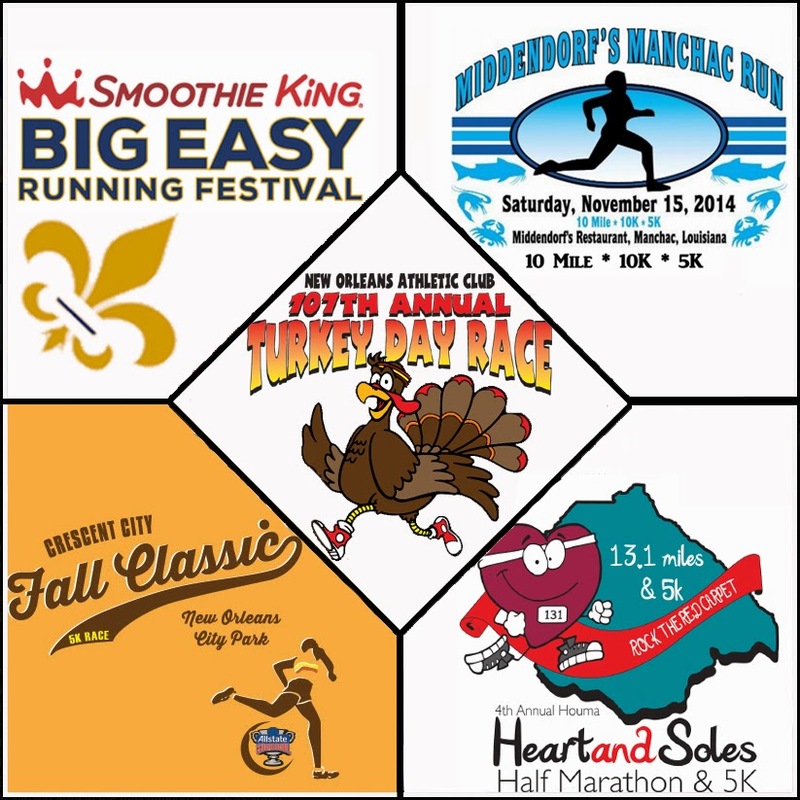 Big Easy Running Festival Half Marathon, 4 & 1 Miler (Sunday, November 23rd @ 7:30 a.m.) - The three races during this inaugural event are staggered throughout the morning, so run one or run them all! Courses for each event are unique and will give great views of the city. NOAC 107th Annual Turkey Day Race 5 Miler (Thursday, November 27th @ 8:30 a.m.) - A New Orleans tradition for generations, it's a great way for family and friends to gather on Thanksgiving morning for a brisk run or leisurely walk before holiday festivities. Mississippi Gulf Coast Marathon, Half, 5K (Saturday, November 29th @ 8:00 a.m.) - Running loops around scenic Stennis Space Center makes up the course for this annual event. Be aware of new security measures for the 2014 event. More info to come.